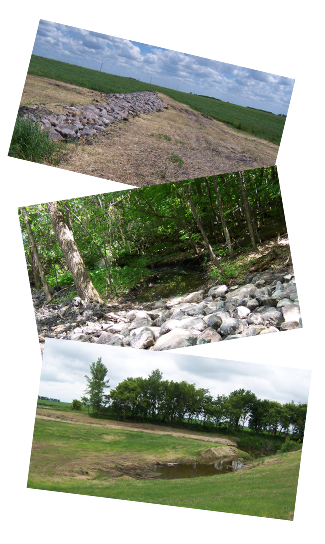 The Sand Hill River Watershed District held many meetings of the project team to find a workable solution to solving the erosion that was occurring at the site in section 31 of Knute Township, Polk County, Minnesota. Meetings were held on site with the affected parties and after much negotiation the final project emerged. The District opened bids on May 6, 2008. The district requested bids on 2 alternatives. One was to install 4 rock dams each with a 4 foot drop that held back water temporarily with no permanent pool. They also asked for bids on work near the lake and the township road which would have acted like a final sediment pond which had no permanent pool. When bids were opened the lower work by the lake put the cost way over budget so that was dropped as part of the project. The district felt that we attained 95% of what we started out to do and do to budget constraints had to drop that part of the project. The district purchased 10.55 acres of land that was in CRP. The area covered the 3 upper dams and will keep the highly erodible land permanently in cover. The district also obtained an easement for the 4th dam site. The work was completed in 2 days in early June. The contract with BWSR was signed on 12-9-05. The district continues its efforts with East Polk SWCD and the landowners to build the fourth structure.